The government has apologised for the failings of the Child Support Agency after criticism from a Dorset MP. Representing the concerns of a mother who has not received maintenance for 10 years, Annette Brooke called for the agency to be scrapped. Department of Work and Pensions Minister Jane Kennedy recognised the problems and apologised. However the minister added: "The agency places emphasis on ensuring complaints are properly dealt with." Is it not time to bite the bullet and genuinely put children first? Mid-Dorset and North Poole MP Annette Brooke told the House of Commons on Tuesday: "The CSA should be scrapped so that a balance can be found between rigidity and unfairness and the complexities of coping with individual cases. "I would like to see a system based on family courts to deal with cases that are not easily resolved. "I would also like to see the Inland Revenue take over some of the functions of the CSA. "There are now probably many aspects that are beyond the current government's control and the new computer system has thrown the system into even greater disarray. "Is it not time to bite the bullet, genuinely put children first and introduce a system that will achieve precisely that?" 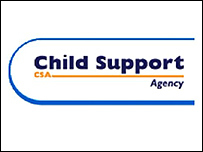 A spokesperson from the Child Support Agency said: "The agency deals with over one million cases and in some it is harder to collect money than others. "This can be true if for example someone does not want to comply with the agency or is wilfully obstructive. "The agency will pursue the maintenance due, using the courts if appropriate."